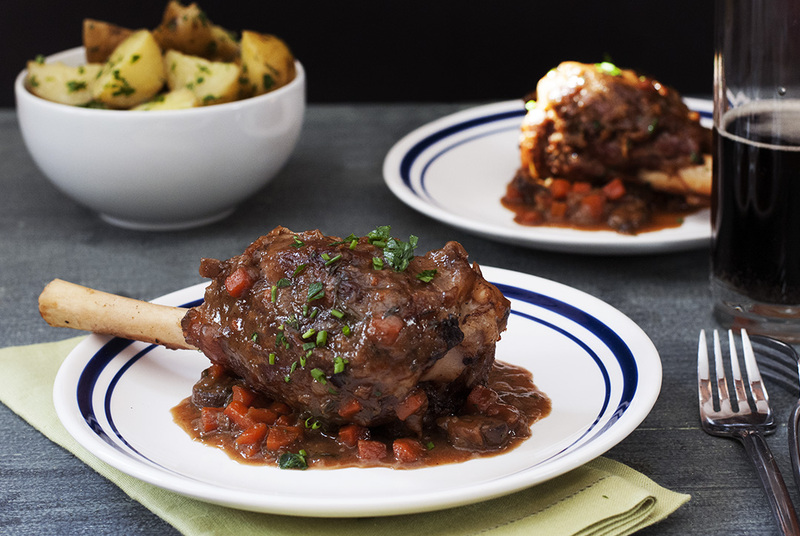 Serve these tender, braised lamb shanks with mashed potatoes or steamed quartered new potatoes seasoned with butter, parsley, chives and sea salt. Heat the oil in a large, ovenproof pan over high heat. Add the lamb shanks and brown on all sides, about 10 minutes. Reserve the lamb to a plate. Add the onions, carrots and mushrooms, and cook for 5 minutes. Deglaze the pan with the Guinness, stirring to release all of the fond from the bottom of the pan. Add the beef stock, bouquet garni, sugar and reserved lamb shanks back to the pot. Bring the liquids to a boil, then cover and place in the preheated oven. Cook for 90 minutes, then test the lamb shanks for tenderness. They should be tender, but not falling apart. Remove shanks from pot and place in a serving bowl, reserve the braising liquid. Combine the butter with the flour in a small sauce pan over medium heat. Cook for a minute or so, then whisk it into the braising liquid, stirring to thicken. Simmer briefly, season with vinegar, salt and pepper, and pour over the lamb shanks.